So here’s a fun little factoid you might be interested in knowing about me before I begin this sermon. My first sermon that I gave in seminary back in 1985 was based on our Gospel reading this morning from Luke, chapter thirteen. This scripture reading is bringing back a whole bunch of memories for me. I honestly don’t think I’ve preached on this Gospel reading since that day in preaching class thirty-four years ago. Dr. Kendall McCabe was my preaching professor and he was very intimidating. He had a reputation for being tough on aspiring preachers like myself. During the semester, each student was expected to prepare and then preach a sermon in front of the class while being video taped. This one sermon would be a major part of our overall grade. It didn’t help that the first person who preached in front of our class was so nervous that great big beads of sweat dripped from his forehead making us all wonder if we should call 911 just in case. He was that nervous. It also didn’t help that this professor said that we had to preach whatever scripture reading he would assign to us. Of course, we were all praying that he would give us a familiar and well-liked scripture reading such as John 3:16 or Psalm 23, you know something comforting, something that would lend itself nicely to a three point sermon, a couple of heart-warming illustrations, and a sweet little poem at the end to tie everything together. As luck would have it, I got assigned our Gospel reading for this morning. I’m going to go out on a limb and assume that Luke 13:1-9 does not make your top ten favorite scripture list. My challenge? To take this very awkward Gospel reading which talks about people getting murdered and another group of people dying because a tower fell on them, and then Jesus’ words that we all need to repent or we will all die like them…take all of that and somehow turn it into an above average sermon for a passing grade. To this day, whenever I preach, I can picture Dr. McCabe sitting out there somewhere with his notepad and pen, analyzing each and every word. And you never knew what he was thinking as you preached your sermon. He always had a poker face, a neutral expression so you never knew what he was thinking. Now, most students did not take preaching class until their 2nd or 3rd year of divinity school but I wanted to get it out of the way. I wanted to face my fear of preaching head on. Yes, you heard that correctly. My fear of preaching. When I decided to go to seminary to become a pastor, my biggest fear was preaching. I was very intimidated by it. I couldn’t imagine preaching week after week. I could see myself leading Bible studies, organizing committees, and eating at potlucks, but preaching? That was scary to me. They say that speaking in public is one of the top fears that people have. When I started seminary, I also needed reassurance that I would be able to make a difference by being a pastor. I knew that becoming a pastor was going to be a long process of not only three years of seminary but also all of the assignments and interviews that would be required of me before I would be able to be ordained a United Methodist pastor. Our denomination has a very extensive ordination process. I honestly didn’t know if I was up for the challenge. It was an exciting time for me but I also was face to face with the fear of beginning this long, long process toward ordination. And here I was facing my fear of putting together this sermon for my preaching class. Ironically, this scripture reading that was assigned to me is about facing fear which is our focus during this Season of Lent. So this is what I discovered when I did my research on this very obscure and mysterious scripture passage from Luke’s Gospel. Jesus is on his way to Jerusalem, the same city where Pontius Pilate had previously sent several of his Roman soldiers to murder Jewish pilgrims who had gathered in Jerusalem to observe their religious holy day festivities. Since Jesus was now on his way to Jerusalem, the same place where the Roman soldiers wiped out a large number of Jewish worshippers, they are wondering why Jesus doesn’t seem to be afraid to go there, especially since he had been attracting a large following of people who wanted to make him a king. The Roman Empire was known to do whatever it took to remind the Jewish people that there was only one king and that King was the emperor of Rome. Jesus’ answer to their concerns seems very unJesus-like because he tells them that the same thing is going to happen to them if they don’t repent. What Jesus is doing here is that he’s trying to help them stop fearing the Romans and fear more about whether or not they are being willing to be open to the new thing that God is about to do through Jesus’ death on the cross and his resurrection. Jesus doesn’t want us to live in fear of what others might do to us like Pilate and the powers that be. Jesus wants us to be be more focused on our willingness to trust God as we face an unknown future. Jesus wants us to trust God more than we fear what others might do to us. And this is why we will find that Jesus will continue his journey to Jerusalem and a possible confrontation with the powers of the Roman Empire. Jesus was more focused on trusting God and how God was going to use him for the sake of others rather than on being afraid. To emphasize his point, Jesus offers a short parable about a vineyard that failed to yield any fruit. When the owner of the vineyard became so frustrated with the lack of fruit that he wanted it cut down, the gardener intercedes and tells the owner to give the vineyard one more chance to bear fruit. 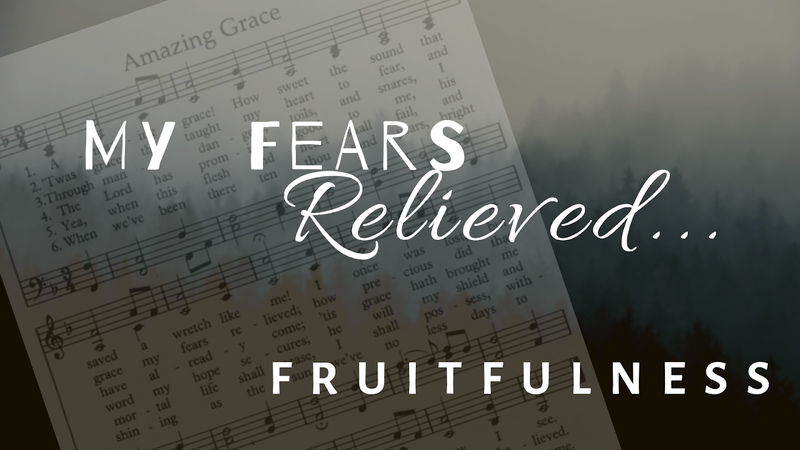 By telling us this parable, Jesus is wanting us to focus more on trusting God and bearing good fruit in the way we live out our lives rather than placing our focus on being fearful. Do you want to be fearful or do you want to be fruitful? It’s our choice, Jesus is telling us. The people who were warning Jesus about going into dangerous Jerusalem weren’t telling him anything he didn’t already know. They just didn’t realize that Jesus was more focused on being fruitful than he was in being fearful. John Newton, who wrote the famous Christian hymn, “Amazing Grace” was born in England in 1725. He became a captain of slave ships. During one of his voyages, off the coast of Ireland, his ship encountered a severe storm. He awoke in the middle of the night and noticed that his ship was filled with water and he called out to God for help. Soon, the cargo of the ship shifted and ended up stopping up the hole where the ship had been taking on water and the ship was able to drift to safety. This would mark the beginning of John Newton’s spiritual conversion. Because of that experience, he began reading the Bible and started treating the slaves with compassion and sympathy. He became a lay minister and eventually was ordained as a priest in the Church of England. He would write a pamphlet called “Thoughts Upon the Slave Trade,” in which he described the horrific conditions of the slave ships. He had this sent to as many people as possible who had influence in helping to end the slave trade. Just before he died, he was able to see the passage of the British Slave Trade Act which prohibited the slave trade in the British Empire. Years after John Newton’s conversion he would confess that he never felt like he was truly converted to Christianity until he started to actively help end the slave trade. It wasn’t until he was producing good fruit that he truly knew that his life had truly changed. One of the best ways that our fears can be relieved is when we seek to be fruitful in the way that we live our lives. A former slave ship captain working to end the slave trade. A bunch of Methodists serving a meal, picking up litter along the highway, leading a worship service in a nursing home, delivering flowers to hospital patients, and helping to build a Habitat for Humanity home. And how about fifty high schoolers giving up their Spring Break to travel to another state and offer their gift of music and serve in the community? Do we want to be fearful or fruitful? Fearful or fruitful? Oh, back to my earlier story. So it was my turn to preach in front of my preaching class. I was so nervous. Here, I was facing my biggest fear. My first big test. All eyes were on me including Dr. McCabe taking notes and not giving me any indication if I was on the right track or not. I took that to mean that it was above average which is a high compliment coming from this hard-nosed preaching professor. And so, Dr. McCabe, even though you’re not really in attendance today, I can’t help but to wonder what you thought of my sermon today on the same scripture thirty-four years later. In my imagination, I saw you jotting down notes. Could my delivery have been better? Maybe I could have explained this difficult passage of scripture in a more helpful way? Was it too long? Too short? What did you think of my little power phrase I used in the middle? Fearful or fruitful? Fearful or fruitful? Kind of clever, don’t you think? More importantly, Dr. McCabe. After all of these years, I just want to say, “thank you.” Thank you for helping me to overcome my fears as a first year seminary student. Thank you for seeing fruit in me that I couldn’t see myself. Thank you for seeing beyond my inexperience, my insecurities, and my fears to what I could become with a little seasoning. Thank you for assuring me just when I needed it the most, that there is nothing to fear, there is nothing to fear, especially when I’m preaching to a people I love, a people who love God, and a people who are fruitful in the ways they live out their faith. This Sunday’s Gospel reading which is Luke 13:1-9 probably does not end up on anyone’s favorite list of scripture passages. It’s where the disciples ask Jesus about Jewish worshippers who were recently murdered by the Roman governor, Pontius Pilate. They also asked Jesus about a tower that had fallen and killed some other people. The reason the disciples were asking Jesus about these very tragic events is because they were fearful of why these things happened. Jesus responds to their questions by encouraging them to not be fearful about those events but to instead keep their focus on following God. Why do tragic events that happen in our world lead us to be fearful? What helps you to overcome your fears of when bad things happen? In addition to encouraging the disciples to focus on repenting and keeping their focus on God, he also tells them a parable about the importance of living out their faith by being fruitful. One of the best ways of overcoming our fear of bad things that happen in the world is to find ways to make a positive difference. What are some positive things that we can do especially in a world filled with so much bad news and negativity? Pastor Robert shared the story of John Newton, the writer of the hymn, “Amazing Grace.” He was a former slave ship captain who had a conversion experience. As a result of his new found faith, he became more compassionate toward slaves and would later work to overturn the British slave trade which actually ended just before he died. John Newton dedicated his life following his conversion to repenting and being as fruitful as possible in making this world a better place. John Newton wrote this hymn to help him remember how God’s amazing grace changed his life. What helps you to remember God’s amazing grace in your life? Share a specific way that you can be fruitful this week.